So... it's been about 6 weeks since my last post, and speaking with complete modesty, the fishing results from this time period have been mediocre. The long awaited trout season opener was on the third Saturday of April. 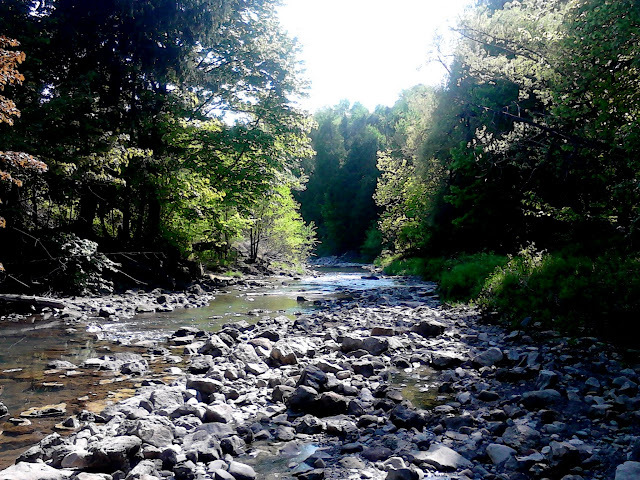 and an hour after sunrise saw me casting to low, clear water that seemed devoid of life. After five visits over a two week period all I managed were a few "bugle trout" aka white suckers. The last day on the river I witnessed a large caddis hatch and in an hour of patient observation didn't see a single rise! It was refreshing to spend a few days witnessing the spring greening in that urban valley without a single human encounter. 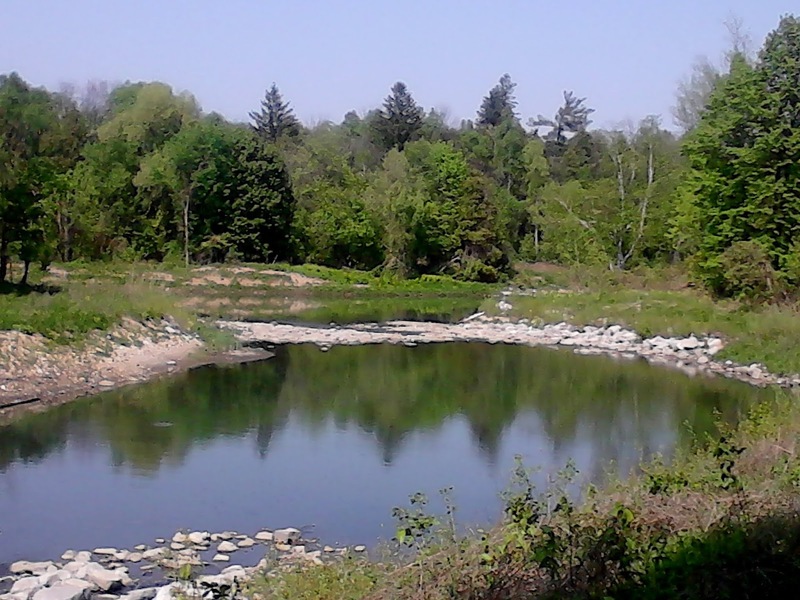 The other benefit was that my local ponds were a short ride away. 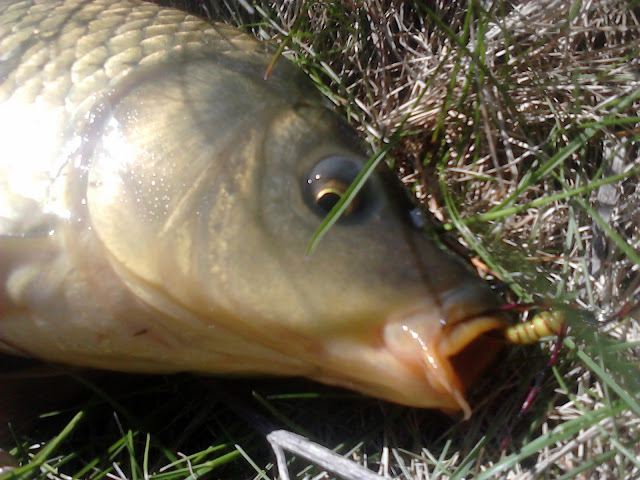 My quest for a carp on the fly was accomplished under bizarre circumstances that left me satisfied less than you might think. Much of the best carp water is surrounded by rushes and low trees, so casting to likely lies was achieved with rollcasts. After the retrieve I'd shake the rod tip to strip out the line for the next cast while the fly sat on the bottom by my feet. 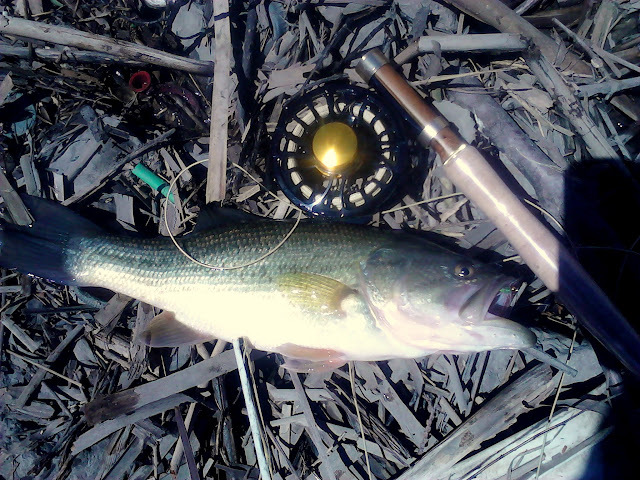 On this particular cast the line shot out but it appeared the fly was snagged on bottom. With a few choice words I resigned myself to the repeated task of disturbing the area by retrieving a muck encrusted stick, but after stripping in all the line the muck encrusted stick turned out to be a 20 something inch carp! I'd been wanting a good bend in the rod for a while but I've had better battles with muck encrusted sticks. That was the one and only carp so far this spring. 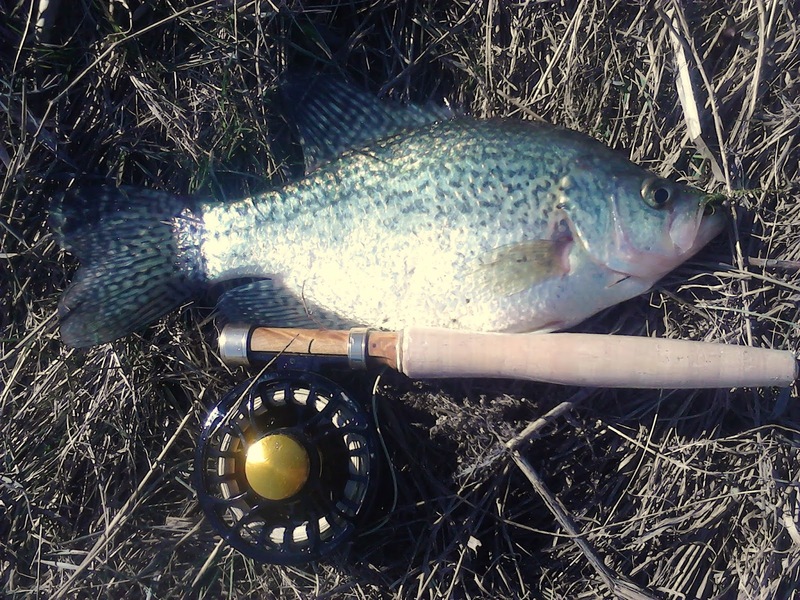 The crappie bonanza from the last post seems to be a one time, chance occurrence. 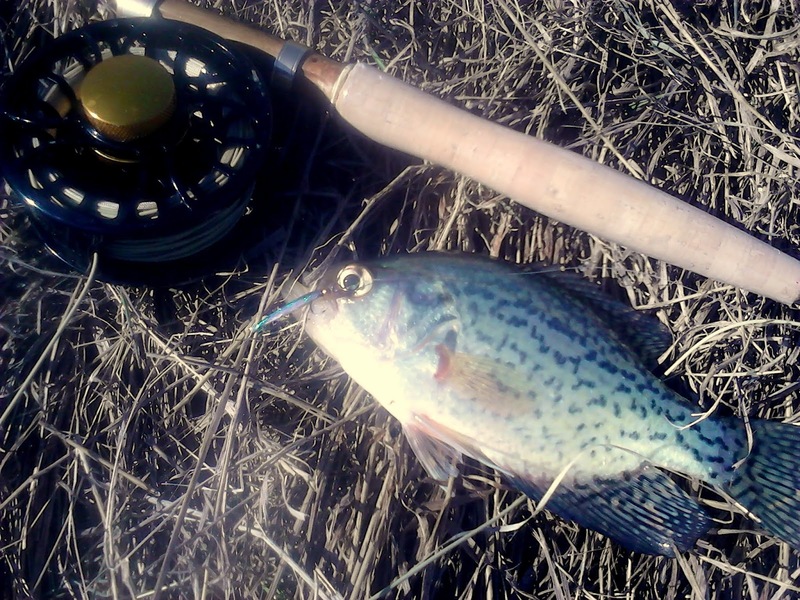 I can count on a few palm sized fish every trip, but numbers of larger crappie seem to elude me. One particular day I couldn't catch anything other than out of season largemouth. 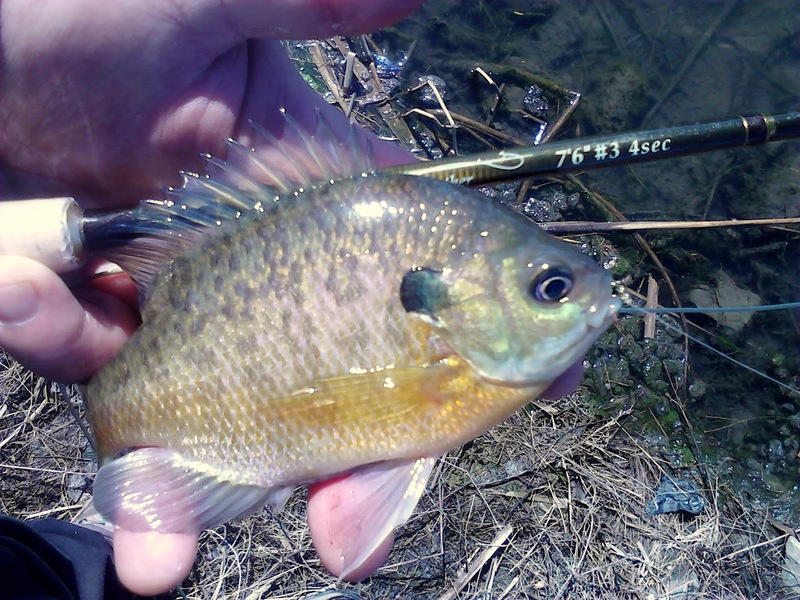 The regulations state incidental catches are to be returned immediately and if the fish continue to bite then you have to move on. Intentionally targeting them is prohibited. Oh well...bass season opens in 3 weeks from now and I'm confident in the flies I've tied and the capabilities of the rod and reel. Over the years I've been slowly gravitating toward ultra lite fishing and that's the reason for the 3wt rod I picked up over the winter. 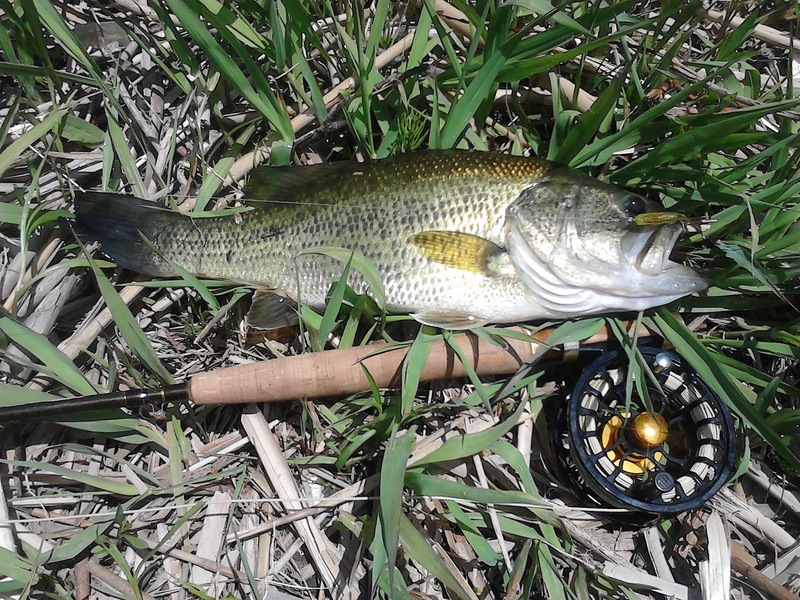 Everything I'd read on line and talking to the few fly fishers I'd met suggested a 3wt was only appropriate for small trout and panfish, but after battling a few 3-4 lb largemouth on a long line (40 to 50 feet) I'm truly interested in pushing the limits of what it'll handle. Amusingly, 3 months ago I traded a pocket full of flies to a local shop owner for a 5' ultra lite Lightning Rod which has yet to see water. Two weeks ago I was out on an errand and, as is my long standing habit, had to stop when crossing a bridge to check out the water. 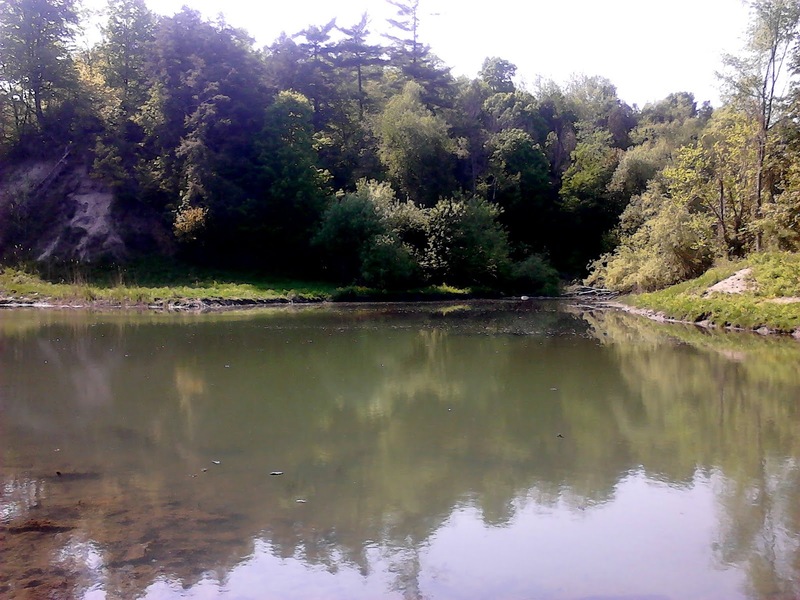 The downstream side had a series of pools that, from a distance, appeared to be full of fish up to a foot in length. 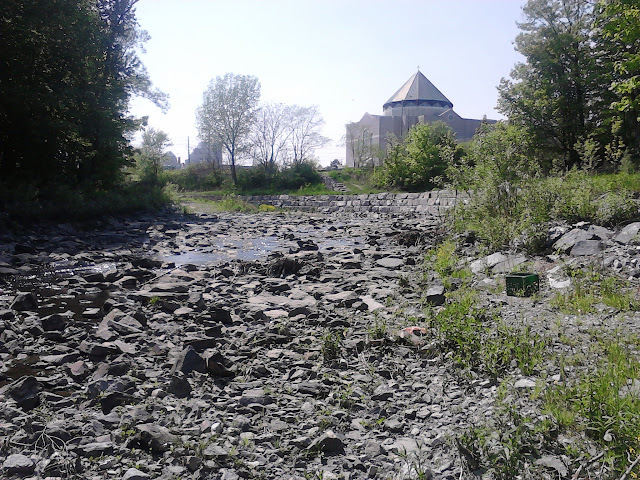 The next day I returned, determined to find what secrets that tiny, urban creek held. I spent a half hour casting the first pool, to the amusement of the urbanite drones at the nearby intersection, cycling through the small selection of flies before finding the right pattern, a #12 bead headed nymph with pronounced red ribbing. Every other cast brought in a creek chub from 4 to 10 inches. I continued bushwhacking down the narrow ravine, highrises on one side, a community college on another and not a soul in sight. Every pool produced numbers of feisty chub but nothing else. A mile in and the creek merged with another I was more familiar with, easier to access and full of students smoking crack or whatever. The 90 degree temperatures, bushwhacking with a mountain bike and crackheads galore had taken a toll and the day out was over for me. So...in a 6 week period I've been out around 20 times, fished 6 ponds,a river and a creek and managed to catch 6 species of fish on the "new" rod, all without leaving the city limits. I really need to get out of town! I left the house yesterday morning determined to finally put a bend in my new fly rod which until now retained it's virginity. 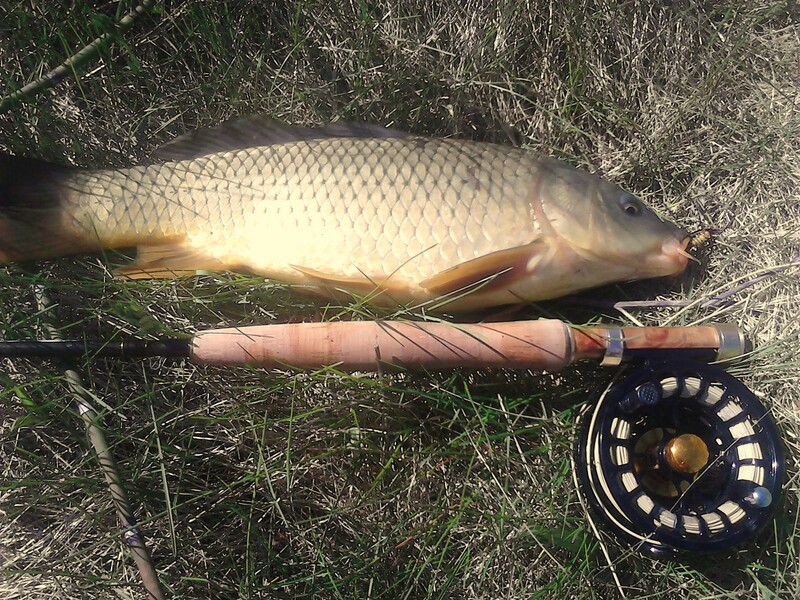 My destination was a series of drainage ponds in the neighborhood that I knew contained a variety of species, but my main target on this day would be carp. After a quick pot of coffee, downed at the tying bench, I loaded the bike with everything I'd need and pedaled off to the ponds. I'd fished the first location a few few times over the past 3 weeks where I'd found the fish milling about, just a few feet away from a bulrush lined shore, 6 inches under the surface. On arrival I found the area buffeted by gusting winds, stirring up the sediments and reducing water visibility to 8". Sight fishing was not going to be possible. 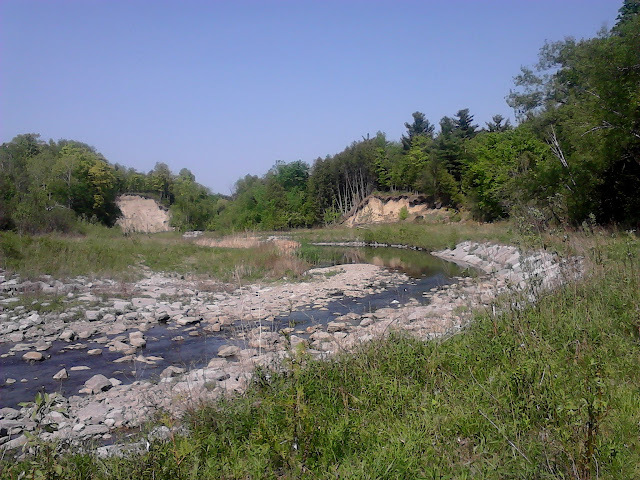 I started casting the area with a wet hackle fly, slowly stripping line and keeping the fly in top foot of water. The cross wind was playing havoc with my casting and line control, sending my fly into a hungry tree on the back cast several times. Fishing sub surface wasn't getting any attention so I tied on a heavy weighted crayfish/damsel imitation and started dredging the bottom. After flogging the water for another 20 minutes with several more fly changes and no results I decided it was time for drastic measures... I assembled my ultra-light and put on a worm! It took no time at all for my float to submerge and a palm sized bluegill to came to hand. One after another they came in with the occasional chub mixed in and a 4' large mouth. 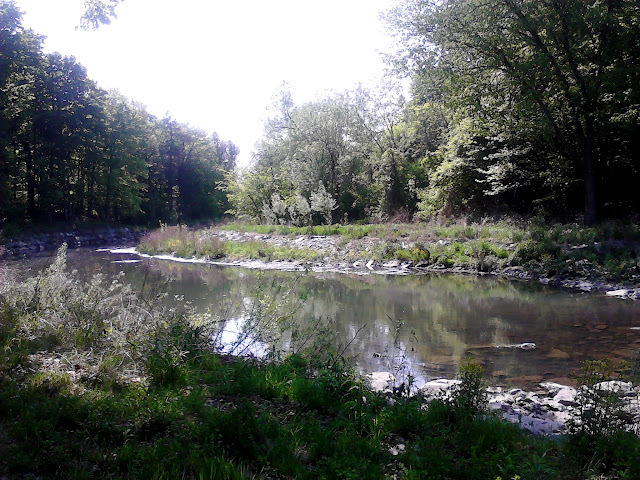 It was comfortable sitting in a camp chair, reeling in panfish at will, but that wasn't what I'd come here for. I moved to the far end of the pond, where the previous year I'd had frequent success with bait. I wasn't finished with the fly rod yet and chose a rocky point as a casting platform that gave good access to the corner while sheltered from the wind and unobstructed room for the back cast. This wasn't a place for a heavy weighted fly as the water's surface was dotted with the leftovers of a beaver's winter snacks. The skeletal remains of treetops, branches and shrubs poked out every few feet making casting risky business regardless of the fishing style. I tied on a bead head nymph with a bright green body and wound hackle and started picking apart the "pocket water". 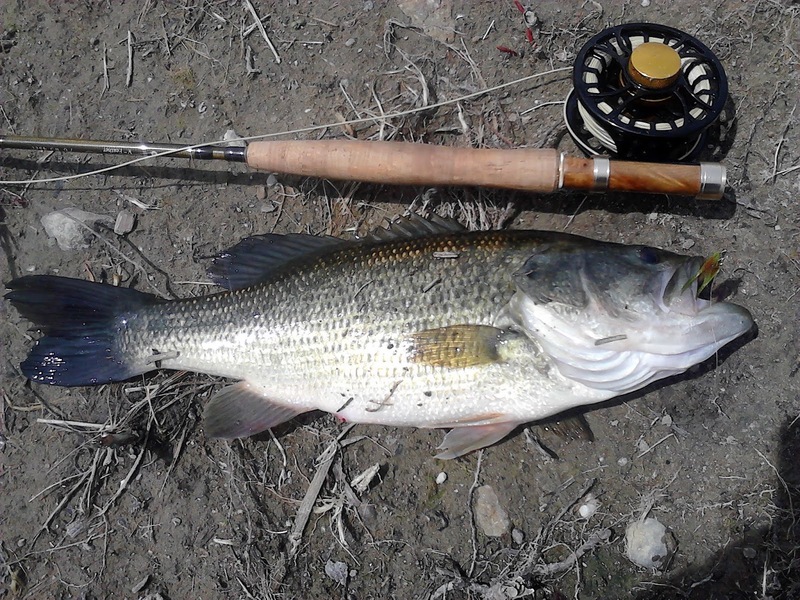 It was't long before I finally popped the cherry on the new rod. It wasn't what I'd hoped to be the first, but the palm sized gill was welcome just the same. Not long after I got a bite that put the good bend in the rod I'd been expecting all morning, only to be surprised to find it wasn't a carp but a scrappy 16' largemouth. A quick pic, live release (bass are not in season until the end of June) and back at it. After a few short strikes and a couple flies lost to the shrubbery I finally got a hook into the fish hiding in an particularly "woody" corner...a palm sized crappie! It's a good thing that when I tie a fly pattern, I usually tie at least 5 in a sitting, as it appeared I'd need all I'd brought. I'd disturbed the area too much by dragging snagged branches across the bottom, and instead of waiting for things to settle down, decided it was time to move on to the next pond a few blocks away. Like the first pond, I'd had multi species days there and the chance of hooking into a carp were good. I worked my usual access points with no luck and eventually ended up at the windswept end, casting into deeper water than usual. On the second cast I landed a small crappie. A few more casts and a couple more fish. This was the first time I'd ever found a school locally but after six fish the bite stopped. I moved farther down the shore, spending time picking apart likely areas but came up empty. By now it was mid afternoon and although I didn't catch my intended species, I was well satisfied with the results and was ready to call it a day. On my way back to the street I thought I'd give the crappie spot one last try with a heavier fly. That was the final piece to the puzzle. Every cast brought in a fish as long as the fly was allowed to sink for at least 15 seconds! 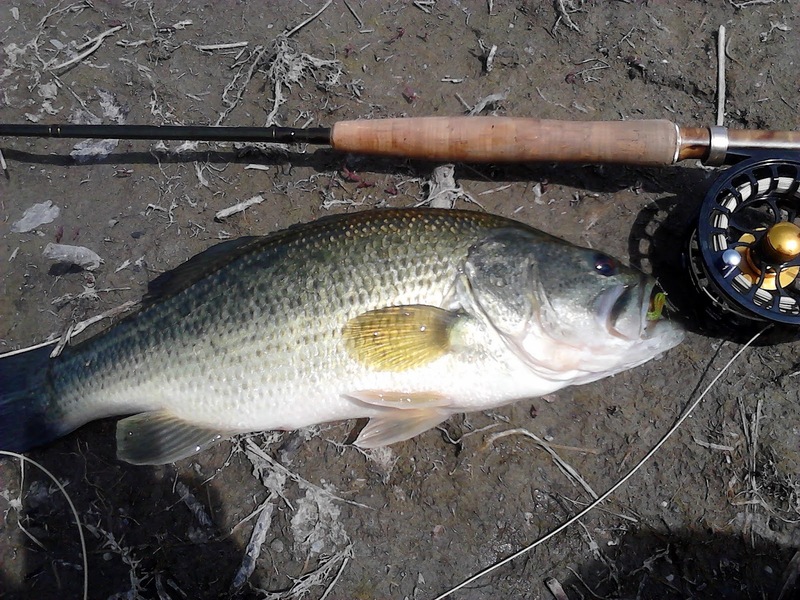 After about 20 fish the line tightened and pulled drag, the rod bent over and as I saw the flash 5 feet below the surface I thought I'd hooked into a good sized bass. Nope. What a surprise to find a 14" crappie on the end of my line! If I'd been on a large northern lake I would have had nice fish dinner, but because this wonderful resource is literally in my backyard, conservation is key. I'm not going to destroy future enjoyment for the sake of a free meal, as I know many of you would agree. Anyways...I came for carp and got blanked, and walked away totally stoked. 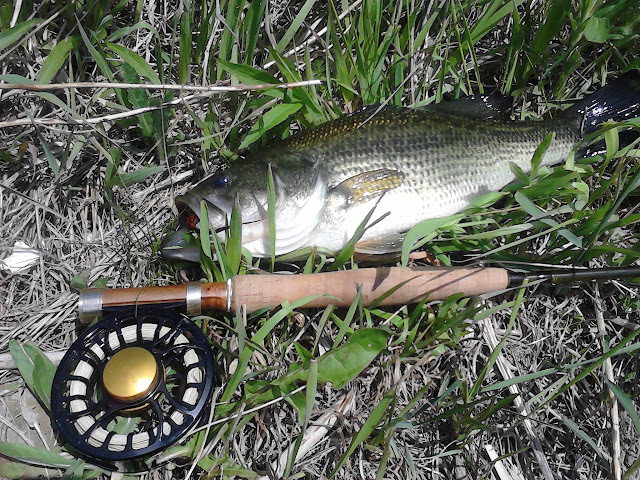 Fly Fishing For Shad - Shad are one of my favorite fish to chase with a fly rod. They readily take small, bright flies and are great fighters. Catching Them All - Michael Verdirame's journey of fishing.